Some courses may have prerequisites or restrictions. Students are expected to complete all prerequisites and meet all course restrictions prior to enrolling. Prerequisite and course restriction information for each course is available at the Schedule of Classes on TritonLink and the UC San Diego General Catalog. Access the Enrollment Authorization System (EASy)! You may begin submitting EASy requests after the summer Schedule of Classes is posted to TritonLink. 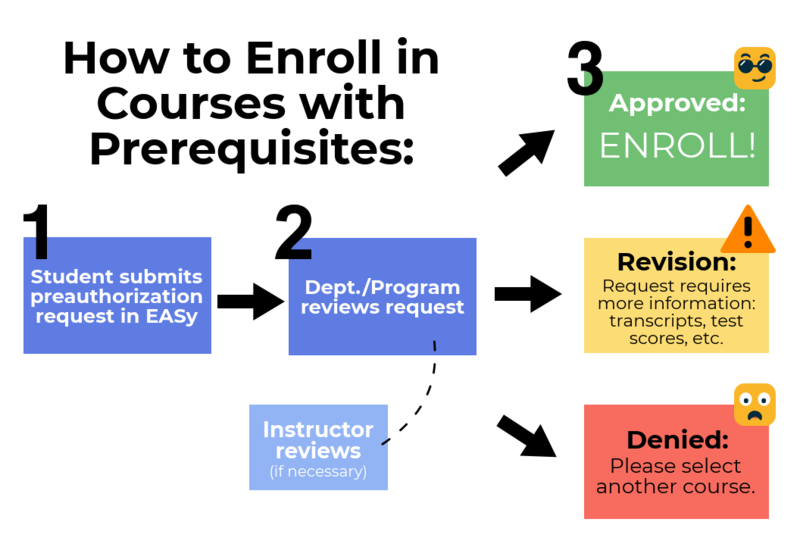 Step 1: If the class you wish to enroll in has prerequisites or restrictions, submit your preauthorization request via Enrollment Authorization System (EASy). Step 3: Upload a PDF file with additional details supporting your justification for enrolling in the selected course. Ex: unofficial or official transcript or official AP scores. The document must include both your printed name and the printed name of the institution. UC San Diego will not accept documentation that has been altered in any way. Step 5: You will receive an email notification once the department has made a decision on your request. In some cases, you may be required to supply additional supporting documents such as course syllabi or transcripts. Step 6: If your request is approved, visit WebReg to enroll. Step 2: If the class you wish to enroll in is upper-division and has prerequisites or restrictions, submit your preauthorization request via Enrollment Authorization System (EASy). Step 4: Upload a PDF file with additional details supporting your justification for enrolling in the selected course. Ex: unofficial or official transcript, degree audit report, or official AP scores. The document must include both your printed name and the printed name of the institution. UC San Diego will not accept documentation that has been altered in any way. Step 5: Submit the request. Step 6: You will receive an email notification once the department has made a decision on your request. In some cases, you may be required to provide additional supporting documents such as transcripts or course syllabi of your prerequisite course(s). Step 7: If your request is approved, visit WebReg to enroll.